In the past eight months, I’ve had dental surgery, planned a wedding, planned a 3-week honeymoon in a foreign country, traveled to Virginia and back five times, lost my dog to bone cancer, helped my husband navigate unemployment and find a new job, searched for an apartment, battled a shady landlady, and slogged through immigration paperwork (that one’s still on-going). If anyone needed sanity secrets, it was me. 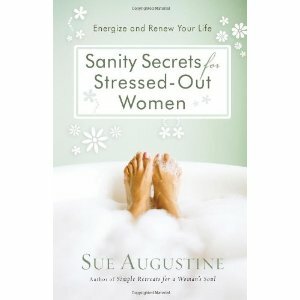 And into that chaos stumbled Sue Augustine’s book Sanity Secrets for Stressed-Out Women. Augustine provides twenty-five sanity secrets to help women manage their time better, prevent or deal with burnout, take control of their thoughts and emotions, and learn to be more content. She undergirds it all with Scripture and uplifting reminders to turn to God in prayer. This book’s strength is in the way Augustine gives a variety of examples of how to apply her concepts, ensuring that each reader can find at least one that suits her. Augustine recognizes that women aren’t mass-produced dolls who all have the same strengths and defects. She’s provided additional insurance that there’s something for everyone by giving twenty-five “secrets.” Maybe you don’t have a problem with drooping body image, but you do have a problem with procrastination. Maybe you don’t struggle with negative self-talk, but you do need hints on how to develop healthy coping mechanisms or find more creative solutions to your problems. As someone who considers herself a member of Augustine’s target audience, my biggest problem was the length of the early chapters and her verbosity. I sometimes found myself wanting her to get to the point rather than making me wade through piles of adjectives and phrases. Yes, her language was pretty, but when my time is short, I want solutions fast. Overall a useful book. I tend to be skeptical about self-help books, but I liked this one enough to donate a copy to my church’s library.